Are you struggling with low milk supply? Have a fussy breastfed baby? After breastfeeding 4 babies, I learned that there are certain foods that actually cause lower milk supply. 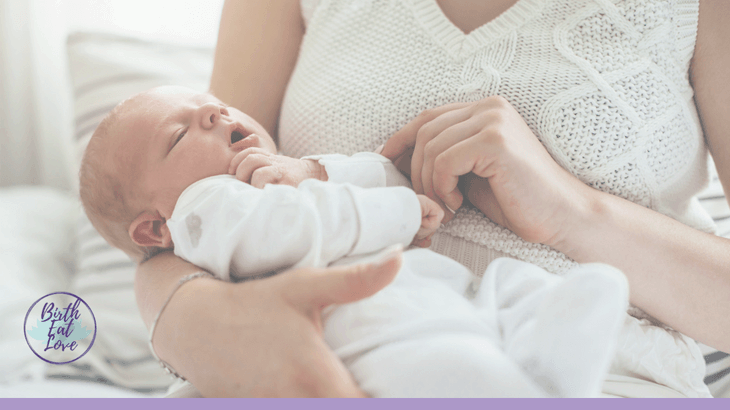 There are foods that can cause gas, colic and indigestion in your newborn baby, which makes breastfeeding (and mom life!) so much harder. I learned the hard way about these surprising foods to avoid for successful breastfeeding. Read on so you can avoid making the same mistakes I did. Now just to be clear – this is not a complete list. It’s just a few common foods that really surprised me when I took them out of my breastfeeding diet. What was the surprise? My babies were easier to care for because they were not suffering from symptoms caused by what I was eating. This was shocking for me. When I had my first baby, I didn’t realize that there were foods that would affect my breast milk and my baby. I ate pretty much what I wanted. It was basically a standard american diet. I struggled for months with a colicky baby who spit up after every feeding. It was like projectile spit up and scary. There were so many tears. On my part and hers. But seriously I thought that was normal. That’s what all the burp cloths and bibs are for, right? Well, with each baby, I learned more and more about the importance of what you eat while breastfeeding. Not only does what you eat affect the quality of your milk supply, but it also affects how your baby feels. And ultimately, how successful you will be at breastfeeding. So let’s look at a few foods that I found made my babies uncomfortable while breastfeeding. Lots and lots of recipes call for adding tomato sauce or tomato paste. I found that tomato based foods like spaghetti and chili gave me indigestion. It was also too acidic for my sensitive newborns. Often they would get diaper rash after eating tomato based recipes. I also noticed that it contributed to acid reflux or what’s called infant GERD. Fresh tomatoes seemed less problematic. But in general, decrease tomatoes and tomato based recipes while breastfeeding to avoid acid reflux in your baby. Sorry, Italian food, there will be plenty of time to eat you when baby weans! So what can you eat instead? Nourish your body and build breast milk supply with these 9 Healthy Soup Recipes for Breastfeeding Moms. Avoiding dairy in the first 6 months postpartum can really help reduce the chances your baby will have colic, eczema and sleep issues. I found this out first hand. My 1st had very bad colic for months and it was miserable. She rarely slept, ate a ton, and spit up A LOT. When I had my 2nd, it started very similarly, but my midwife suggested that I avoid dairy. Within days my baby was happy, cooing and a great sleeper. After a few weeks I thought, surely it wasn’t the dairy and added it back in, only to get a fussy, spitting up baby. So after that I was sold and refrained from dairy with baby 3 and 4 from day 1! They were both relatively easy babies as long as I avoided the foods on this list. Want to know the strange thing I noticed? My younger 2 kids rarely ever spit up. Like almost never…unless I had dairy. If you are struggling with fussy newborn, dairy would be the first thing I’d give up. Replace cow’s milk with nut milk and avoid cheese, sour cream, cream cheese and butter. This is not an issue for everyone, but definitely something to try if while breastfeeding your baby suffers from colic, eczema or sleep issues. Sign up for the Birth Eat Love email list below to get tips like these delivered to your inbox! While this may be somewhat controversial, grains cause inflammation of an already sensitive and taxed postpartum gut. Also eating foods like bread, muffins and pasta fills you up, but contains less nutrients than other foods that are more beneficial for you. I talk a little about my experience going gluten free in this post on pregnancy eating mistakes. I went gluten free during my 3rd pregnancy, but thought the radical health changes were just some kinda of fluke pregnancy thing. So I decided to eat pizza and calamari a few weeks postpartum, only to have my baby break out (and get fussy from the tomato sauce!). And a tiny psoriasis patch appear on my leg the next day. Coincidence? Maybe. But, I went back to gluten free real quick. Reduce bread and pasta, or opt for gluten free versions. Need carbs? Add in more rice, potatoes, oats (gf) and quinoa to your breastfeeding diet. Parsley, peppermint, oregano, thyme and sage are very common herbs used in many recipes. I was shocked to learn that these common herbs are actually shown to decrease breast milk supply. Mostly because I breastfed 4 babies and just found this out! These are common spices included in many pre baby freezer meal recipes you will find on Pinterest and Google. They are also common ingredients in spice mixes, so be aware when using them while cooking. Are you making pre baby freezer meals? Don’t waste your time making all those freezer meals until you read this! While these are all super healthy foods that are definitely good for nourishing your pregnant body, they can cause gas in newborn babies. When babies have too much gas they can become uncomfortable and fussy. Many babies will squirm and even turn red when they have trapped gas. 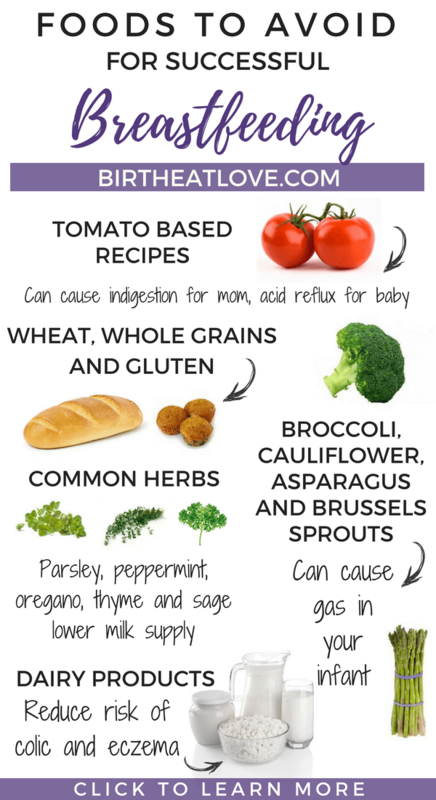 Avoiding these gassy vegetables while breastfeeding can help avoid extra discomfort in your newborn. Make sure to pin this infographic for later! How does healthy diet make breastfeeding easier? Well simply put, when you have a good milk supply, baby is happy. When baby is happy, Mama is happy. So much of the stress of breastfeeding is around the struggle with milk supply. The better you eat, the better your milk supply will be. A happy baby sleeps well, coos and smiles after feedings and is generally peaceful. THIS makes Mom life so much easier because you are not constantly soothing a crying and uncomfortable infant. This means you are less weary and able to respond better when needed. Which means you will worry less and spend more time enjoying your newborn. But no fear, Mama, if your baby is not the happiest. There are things you can do! Try some of these tips for soothing a colicky baby. And start looking at what you are eating and consider removing some of the foods from the list above. It took me 4 babies to get it right. 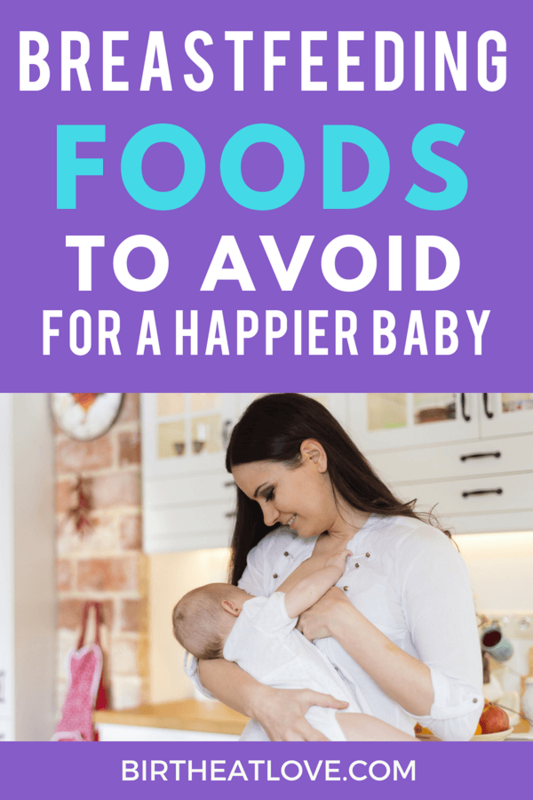 While these foods seem innocent enough, they really can wreak havoc on your milk supply and your baby’s delicate system. There is soooo many breastfeeding myths! Especially about what you can and can’t, or should and shouldn’t eat while breastfeeding. 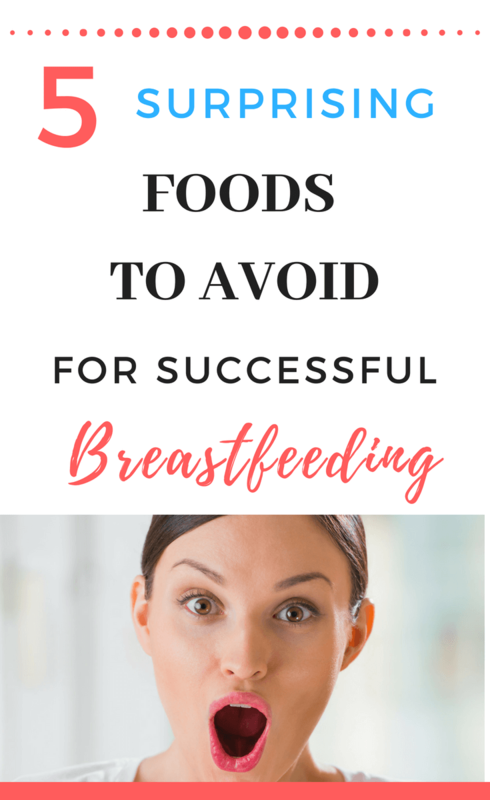 There are lots of foods that you will find on both the foods that support and foods to avoid while breastfeeding lists depending on the source you consult. Which makes it kinda confusing for a Mama to know what to eat! In many ways, the best advice is to pay attention to your body and your baby. What affects one may not affect you, and what affects you, may not affect others. So, it’s always important to keep that in mind when reading advice online. These are just general guidelines. For example, onion and garlic are often listed as foods to avoid mostly because eating them raw can be hard on baby’s stomach. But these nourishing foods actually are immune boosting and very good for you and baby when cooked. And spicy foods are tolerated well by some and not by others. A good rule is to try things in moderation. Focus on eating foods that are breastfeeding friendly and boost milk supply. See how your body and baby react, and then plan accordingly. You can be successful at breastfeeding, if you focus on caring for your body and creating a environment supportive of breastfeeding. And the good thing is, that most of these newborn food sensitivities while breastfeeding only last about 6 months. So if you breastfeed past 6 months these food are much less an issue. 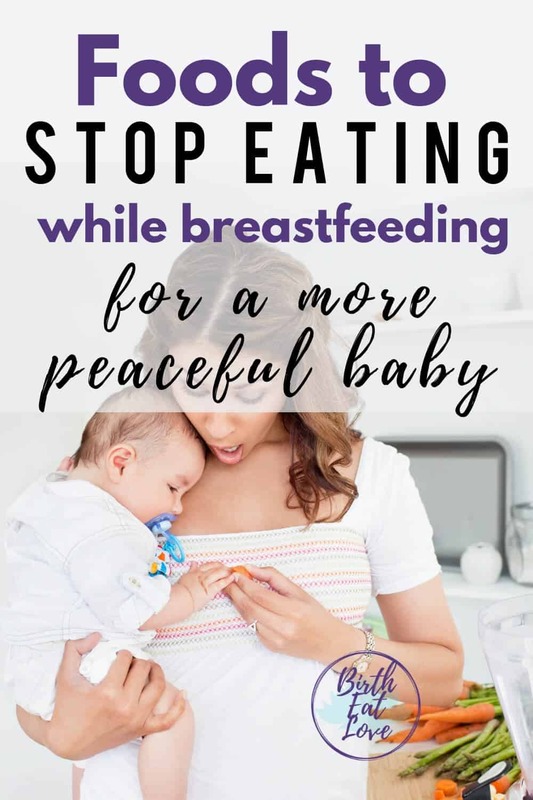 So what can you eat then while breastfeeding? It may seem like this eliminates a lot of foods and you may be wondering – what the heck can I actually eat? 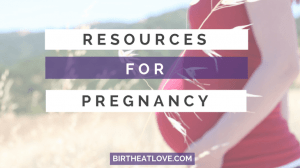 Here are a few of our best resources that can help! List of Breastfeeding Snacks – all healthy, dairy and gluten free. Plus low in sugar and high in protein so that you feel full longer and have more energy. Foods to Increase Milk Supply – all the foods on this list are good for you to eat and help make a high quality milk supply. This list includes recipes and product/supplement ideas for each food. Breastfeeding Soup Recipes – soup is an amazingly nourishing food and can help you make more breast milk. Plus the recipes in this list can all be made in the slow cooker or instant pot making them super easy meals. Pumpkin Lactation Recipes – do you love pumpkin? All these ideas are breastfeeding friendly and includes recipes for snacks, smoothies, breakfast, lunch, and dinner. Healing Freezer Meals for Postpartum and Breastfeeding – This guide walks you step by step through preparing 12 easy, healthy freezer meals specifically tailored for breastfeeding moms. Get your copy here! Looking for some tips to make breastfeeding easier? 15 Moms share what helped them solve their breastfeeding problems. Learn their secrets for rocking breastfeeding here! Are you planning on going back to work and need to learn how to pump breast milk and stock your freezer while on maternity leave? This awesome online breastfeeding course will teach you everything you need to know! Do you want to get back in shape and keep your milk supply up? Need a plan and a little motivation to make it happen? You will love the Postpartum Cure! Learn more about how to get your body back after baby here. Do you have all your breastfeeding essentials? Check out these adorable nursing pillows, breastfeeding covers, and breastfeeding shirts from Udder Covers! Click HERE to Get $35 OFF your order with the code MOMSAVE35! Postpartum breastfeeding diet, breastfeeding food, for mamas, healthy eating, new moms, postpartum. permalink. This is insane. I m so glad I found this. Im having my second baby in February and I fouund this to be extremely helpful. Thanks for sharing. Thank you Nadia!! Congrats on your pregnancy! So glad to help! Thanks for your comment Sidney! I am sure there are lots of Moms thinking the same thing – this is just too hard to do. But really it just takes a shift in mindset. There are many dairy free and gluten free recipes and products available to use as substitutions. Eating Paleo is definitely an option too, as those recipes are gluten, dairy and tomato sauce free. For a list of foods sign up for my email list on this page and I’ll send you a breastfeeding friendly grocery list. Then simply make meals around those foods.